The number of seeds to sow can range from 1 to 10 pounds per 1,000 square feet (about 32 feet by 32 feet). Find and follow the seeding rate on seed bag label. Putting down too much seed creates too much competition between the seedlings. Apply the seed in two different directions using a hand or push drop spreader calibrated to deliver half of the recommended seeding rate. Rake lightly to mix the seed and soil so that the seed is covered no more than 1/16 to 1/8 inch deep. If laying sod, keep in shade so it does not dry out, and install in a staggered brick-like fashion without delay. To avoid competition, don’t plant too much seed. Spread a thin layer of weed-free straw to conserve moisture and minimize seeds moving off site with soil. Be sure there is good seed to soil contact using a lawn roller that is half full of water. Do not overfill the roller as it may crush seed and contribute to soil compaction. Do it yourself people might find a lawn roller at a local equipment rental center or contract with a local landscape company for this task. For smaller areas, rolling a 5 gallon bucket on its side over the area might be effective. Water seedbed only enough to keep the surface moist. 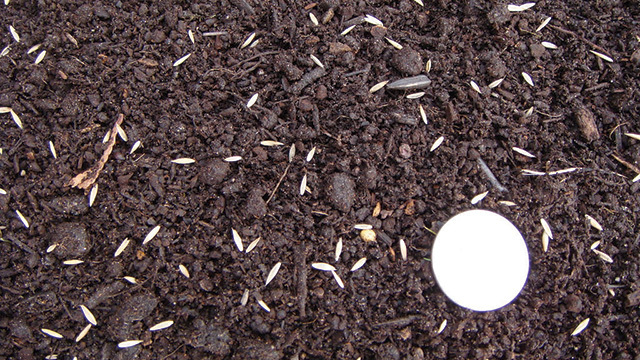 Overwatering can result in seeds moving off site with soil. Gradually reduce water after seedlings emerge to encourage deeper rooting. About 2 to 3 weeks after seeds emerge, spread 1pound of nitrogen fertilizer per 1,000 square feet. Once the grass covers the majority of the ground, the surface should be allowed to dry. Wait until the grass reaches at least 4 inches before mowing. Follow the four steps to success from the start. Note that dull mower blades will tear young seedlings from the soil. Overseeding is the periodic application of lawn seed to an existing lawn to improve density. A thin home lawn may benefit from broadcasting grass seed over the top after core aeration (described in soil compaction). Always be sure there is good seed to soil contact and adequate moisture.